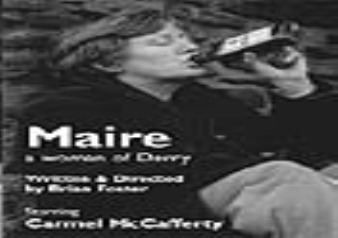 Derry playwright, Brian Foster's hilarious, harrowing and ultimately heartbreaking story of foul-mouthed, feisty street alcoholic, Maire Mc Laughlin, has played to packed houses and standing ovations throughout Ireland and America. Maire has audiences everywhere spellbound as she recreates, in her own unique style, the huge collection of characters that have coloured her life. From Big Bridie to Tina the Tap to Jimmy the Tadpole, actress Carmel Mc Cafferty brings them all to life with unbelievable stagecraft. Hailed as ‘unmissable' by the critics, Maire- A Woman Of Derry is a theatrical triumph. Please note this play contains strong language throughout and is unsuitable for under 14s. Please do not come to be offended. This is a special charity performance in aid of Romanian orphans.